1. Initial tournament and satellite seats will be randomly assigned. 2. Players going from a broken table to fill in seats assume the responsibilities of their new position. They may receive any position from blind to button. 3. The only place a moved player cannot be placed is between the small blind and the button. If it is necessary for a player to be moved to this position, that player must sit out that hand. 4. A player moved to balance two tables will be the player who will not lose position as a result of the move. Play may be halted temporarily to accommodate for the move. In a case where multiple seats are open, the worst positioned seats are the most preferable to be moved. 5. A player who intentionally dodges his blind(s) when moving from a broken table will forfeit the blind(s) and/or incur a penalty. The money will be put into the next pot and will be considered dead money. 6. Prior to the “bubble” (the point where only a few more players must be eliminated for all remaining players to be guaranteed a portion of the prize pool), the tournament may be played “hand-for-hand”. This means that each table will wait until all other tables finish their hands before starting another. This deters stalling by players in an attempt to place higher. 7. Hand-for-hand play may also be instituted during times where stalling to receive a higher place in the tournament would be advantageous to any player. 8. A player with no chips may not miss a hand. If a player with no chips misses a hand, they lose their right to rebuy and are no longer able to participate in the tournament. 9. If a player announces intent to rebuy before the first card is dealt but does not have chips yet then that player is live, playing behind, and obligated to make the rebuy. 10. Players can only rebuy between hands, under no circumstances will a player be allowed to make a rebuy when cards are out. 11. If rebuys are permitted in situations where the player still has chips when the rebuy is made, that player must settle the rebuy completely to allow those additional chips into the next hand. Thus a player is not permitted to play from behind if they have chips in front of them. 12. If rebuys and add-ons are only permitted until a certain point in time, a player has until that point in time to provide funds for the rebuy. 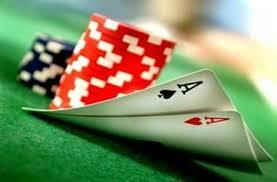 If funds are presented at that time, then the player may rebuy and/or add-on. 13. One player to a hand. During the hand, a player may not discuss play with other players, spectators, or the dealer. 14. English only at the table for games in the United States. 15. Players may not exchange chips for any reason. 16. A player who wants to use a cellular phone or any communication device must step away from the table. 17. A player may not leave a camera, cell phone, any recording instrument, or highly reflective item on the table. 18. Rabbit hunting (asking to see additional board cards after play is over) is forbidden as it can give insight into players’ hands by reducing the possible number of unknowns. 19. The tournament coordinator reserves the right to cancel or alter any event at its sole discretion in the best interest of the tournament and/or its players.